America's Oldest Speed Shop®. 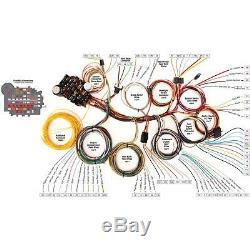 Speedway Universal 22 Circuit Wiring Harness. Whether you're building an option loaded car or just want to have extra circuits available for future updates, this harness is perfect and makes any job painless. Compact 5-1/2"L x 4-1/2"W x 3-1/4H fuse block holds 18 standard push-in fuses and can be mounted almost anywhere. Each high temperature wire is color coded and labeled every six inches. Also includes GM type steering column connectors. To keep costs down and the quality high, this harness does not include any switches, light sockets or plugs that you would normally already have. Harness has 22 circuits (all fused). Taillight leads measure 17' long. 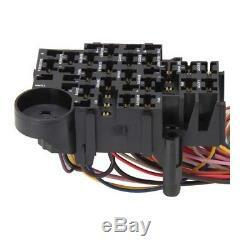 Includes plug for GM column, headlight switch, dimmer switch, and signal flashers. 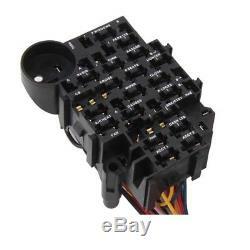 Note: This kit includes ribbon plugs to connect to most GM and aftermarket columns, in addition to including plugs to connect to the ignition switch on "keyed" GM columns. Includes GM column plug, headlight switch, dimmer switch, and signal flashers. Leads to taillights are 17.00 feet long. 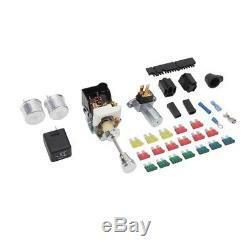 UNIVERSAL FUSE BLOCK REPAIR KIT 91064003. Great way to wire a vehicle. By Squarebody 1976 on June 02, 2018. Laid out complete and a very budget friendly price. Yes, I recommend this product. By Brent on May 20, 2018. I have bought several wiring harnesses before, but this was the first Speedway Harness. The directions and pictures were amazing. Colored newspaper size directions with pictures and colored, wires with each one marked with where it should go. Anyone could wire a car with these directions. I would recommend this harness again for anyone needing one. By 62ute on May 20, 2018. 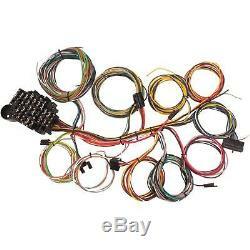 Used this wiring harness to re wire a 54 ford customline, plenty of circuits, easy to use, good instuctions. By Penn on May 10, 2018. Do yourself a favor and save yourself a headache!! This harness is not only reasonably priced but it has everything you will need to redo your wiring in your project. Ls swaps will still need the trans and engine harnesses. Great quality product with all the right stuff! By WOScholar on May 07, 2018. Love that every cable is labeled and then wound and wrapped into batches that go together. Great product at a great price. Related Items / Suggested Parts. Dorman 85623 Fusible Link Wires, 14GA, 3/8 Eyelet. Rubber Grommet and Plug Set, 125-Piece Assortment. Book - How To Wire Your Street Rod. Please pay for all items at the same time. We cannot combine your order if you have already paid. Speedway Motors is Americas Oldest Speed Shop® and has been a trusted source for specialty rodding and racing products and friendly expert advice for more than 66 years. Repack the item in a sturdy box, include a copy of your invoice and complete the form on the back of the invoice. All exchanges need to have reshipping charges included. Speedway accepts full responsibility for the accuracy of our listings and product representation. The item "Speedway 22 Circuit Universal Street Rod Wiring Harness with Detailed Instructions" is in sale since Wednesday, April 8, 2015. 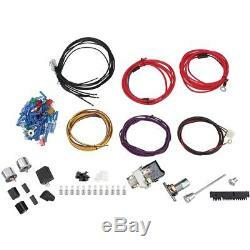 This item is in the category "eBay Motors\Parts & Accessories\In-Car Technology, GPS & Security\Terminals & Wiring\Wiring & Wiring Harnesses". The seller is "speedway_motors" and is located in Lincoln, Nebraska. This item can be shipped to United States, Canada, United Kingdom, Denmark, Romania, Slovakia, Bulgaria, Czech republic, Finland, Hungary, Latvia, Lithuania, Malta, Estonia, Australia, Greece, Portugal, Cyprus, Slovenia, Japan, China, Sweden, South Korea, Indonesia, Taiwan, South africa, Thailand, Belgium, France, Hong Kong, Ireland, Netherlands, Poland, Spain, Italy, Germany, Austria, Bahamas, Israel, Mexico, New Zealand, Philippines, Singapore, Switzerland, Norway, Saudi arabia, Ukraine, United arab emirates, Qatar, Kuwait, Bahrain, Croatia, Malaysia, Brazil, Chile, Colombia, Costa rica, Dominican republic, Panama, Trinidad and tobago, Guatemala, El salvador, Honduras, Jamaica, Antigua and barbuda, Aruba, Belize, Dominica, Grenada, Saint kitts and nevis, Saint lucia, Montserrat, Turks and caicos islands, Barbados, Bangladesh, Bermuda, Brunei darussalam, Bolivia, Ecuador, Egypt, French guiana, Guernsey, Gibraltar, Guadeloupe, Iceland, Jersey, Jordan, Cambodia, Cayman islands, Liechtenstein, Sri lanka, Luxembourg, Monaco, Macao, Martinique, Maldives, Nicaragua, Oman, Peru, Pakistan, Paraguay, Reunion, Viet nam.